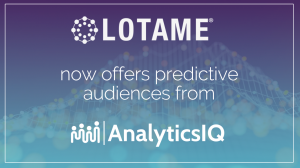 Predictive B2C and B2B marketing data from AnalyticsIQ is now available for advertisers' direct access within the Lotame platform. ATLANTA, GEORGIA, USA, April 10, 2019 /EINPresswire.com/ -- Predictive analytics and marketing data innovator, AnalyticsIQ, is pleased to announce an official partnership with Lotame, the world’s leading unstacked data solutions company that helps publishers, marketers and agencies find new customers, increase engagement, and grow revenue through audience data. Through the relationship, Lotame clients now have access to over 1,000 AnalyticsIQ branded data segments for cross-channel targeting.